A sloth named Adam Capper is one of the main characters who lives in The Life Tree. We love these adorable creatures and as today is International Sloth Day we thought it was only right to pay tribute to these little bundles of cuteness. Did you know that sloths are the slowest mammals on earth! They live in the rainforests of Central and South America and spend most of their time in the trees where they eat and sleep. They only ever leave the safety of the trees for the call of nature (we all have to go sometimes!) and to go for an occasional swim! There is a misconception that sloths are lazy but we can assure you that they are not. They move incredibly slowly but scientists think that this may be due to the fact that these gentle tree dwellers have a complex digestive system which digests food very slowly. It can take up to a month for a sloth to digest one meal and their diet is not very nutritious so it does not give them much energy. All in all, it is easy to see that they have very little energy to move around. And yes they really are slow, a sloth will travel around 6 – 10 ft per minute. Not great if you are trying to escape from a predator! No wonder sloths spend most of their time in the trees, eating and sleeping there and only coming down about once a week. There are six different species of sloths. Of those the pygmy sloth is critically endangered and the maned sloth is classified as vulnerable. Sloths are categorised as either two-toed or three-toed. In actual fact all sloths have three toes but the two-toed sloth has only two fingers – yes we are confused too! Sloths are not particularly sociable animals, probably the most sociable they will get is when they sleep in the same tree as another sloth! The only other time a sloth is obligated to be sociable is when it comes to mating. 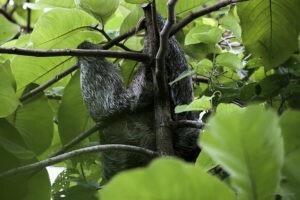 As with most other sloth activities, mating takes place in the trees and starts when a female yells out a mating call. Males will vie for her attention by hanging from the branches and pawing at each other with their sharp claws. The winner’s prize is a night with the female sloth! A sloth’s gestation period ranges from 5/6 months to 11 and a half months depending on the species. Baby sloths are born in the trees and can stay with their mothers for up to four years. Modern day sloths are around 50-60 cm long. But skeletons have been found of now extinct sloths that show some were the size of elephants! Sloths can extend their tongues 10 to 12 inches out of their mouths. The Sloth’s thick fur is a great habitat for moths, beetles, cockroaches, fungi, and algae to live and grow. The green coloured algae that grows on sloths’ fur provides a great camouflage to help them avoid predators. Two-toed sloths are nocturnal, being most active at night. While three-toed sloths are diurnal which means they are most active during the day. It used to be thought sloths sleep for 15 to 20 hours a day. However, it is now believed they only sleep around 10 hours a day – see, we told you they weren’t lazy! Recent studies have shown that the algae and fungi in the sloth fur may help fight many human diseases, including cancer. Today, 20 October, is International Sloth Day – an unofficial holiday created by the AIUNAU Foundation. The Colombian-based conservation and wildlife organisation hope that focusing attention on these fabulous creatures will raise awareness about their life cycle and the natural habitat of the sloth. So today take time to find out a bit more about these lovely animals and honour the sloth – the sweet and charismatic tree dwellers!